Named after its resemblance to the popular hardy perennial black-eyed Susan (Rudbeckia spp.) grown throughout the U.S., black-eyed Susan vine is instead a tender perennial climbing vine that is normally grown as an annual. They are great plants for containers and hanging baskets and are particularly beloved for their distinctive flowers, which are generally vivid yellow or orange with dark centers. The plant blooms for many weeks. Black-eyed Susan vine is a diminutive vine that grows to a maximum of about 8 feet when grown in containers, although it can grow to 20 feet in frost-free zones. This tender perennial is normally grown as an annual, prized for its bright blooms, which are usually yellow or orange. The dark centers give the flowers a similar appearance to the hardy perennial black-eyed Susans familiar in garden plantings throughout the U.S.
Black-eyed Susan vine has arrow- or heart-shaped green leaves up to 3 inches long, and orange/yellow flowers about 2 inches wide with five spreading petals and dark throats at the center. The plant typically blooms in summer through fall, with best blooming occurring after the intense heat of mid summer is past. In frost-free climates, the vine is evergreen. This plant climbs by twining up support structures rather than clinging with tendrils. A native of the tropical areas of East Africa, black-eyed Susan vine carries the taxonomical name Thunbergia alata, named after Carl Peter Thunberg (1743 to 1828), a Swedish botanist. The plant is sometimes known as clockvine. In the U.S., black-eyed Susan vine is grown as an annual in USDA hardiness zones 3 to 9, but can be grown as a perennial in the warm zones, 10 and 11, where it can be invasive if it escapes and naturalizes. The plant is a particular problem in some parts of Florida. A number of different cultivars are available with many different flower colors, including white, pink, rose, and purple. 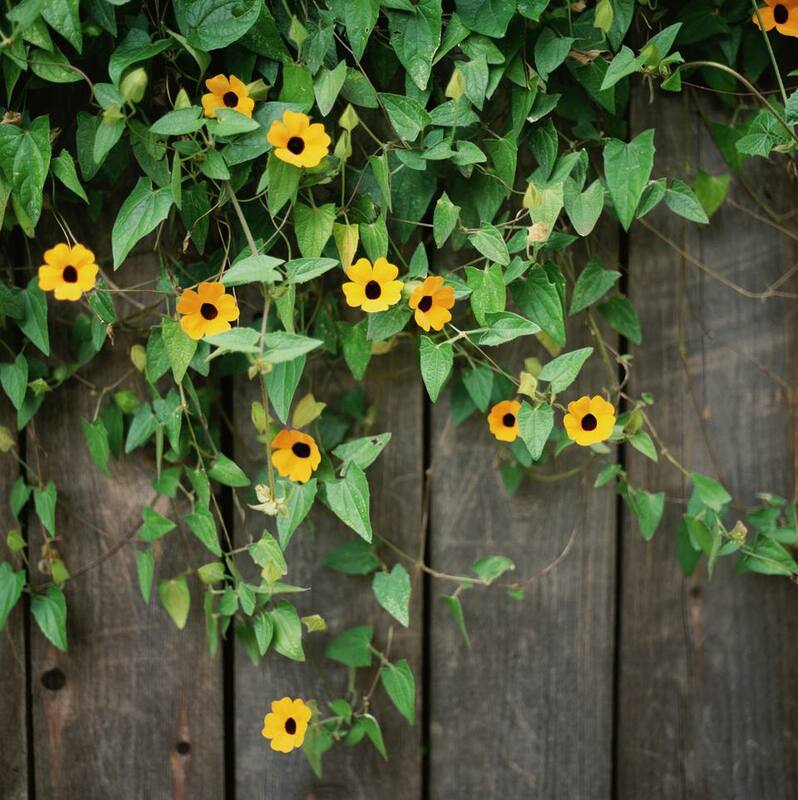 Black-eyed Susan vines are usually planted as annuals in containers or hanging baskets with mixed plantings, but they can also be planted in the ground to cover trellises, arbors, fences and other structures. The plant works well to cascade down over retaining walls, and it can also serve as a ground-cover plant. Aesthetically, it presents very well when combined with plants that have purple leaves or flowers. Potted plants can be brought indoors to overwinter as houseplants; they may continue to bloom if they receive enough light. Plant black-eyed Susan vine in soil that is rich and fertile, well-drained with medium moisture-retention properties. The plants are easily started from seeds sown directly in the garden after the last expected frost date. In colder climates, nursery transplants are normally used; or, you can start them indoors 6 to 8 weeks before last frost. When growing in pots, use large, spacious containers that can manage the large root system that will soon develop. Grow these plants in full sun to part shade; some afternoon shade is beneficial, especially in warmer climates. When planted in the garden, position the plants 12 to 16 inches apart. Feed the plants every 2 to 3 weeks during their bloom season. Potted plants can be over-wintered indoors in a warm room with plenty of sun, or you can take cuttings from plants, root them indoors, and plant in new pots in late winter. Thunbergia alata is free of most serious insect or disease problems when grown outdoors, but indoor plants can exhibit scale, spider mites, and whiteflies.